Basically, Chromecast is a Google designed gadget which lets you stream and mirror content from your smartphone to your TV screen or run various apps to watch movies, listen to music or even play some games, all these on your non-smart TV. This way, your Android smartphone becomes a smart remote, paired with your TV. How do you connect Chromecast to a TV? It’s pretty easy, actually. Chromecast comes with just 2 cables. There’s an HDMI cable that goes into your TV port, to provide sound and picture. The other cable is used for powering Chromecast, including an adapter. You may either use your wall outlet or an USB port (if your TV has one) to power Chromecast. Once connected, Chromecast is easy to configure. First of all, download Google Home app on your smartphone and follow the wizard to connect Chromecast to your smartphone. After that, this streaming gadget is ready to mirror the content of your smartphone on the TV or run some apps. Chromecast is compatible with Android smartphones and tablets, iPhones or Windows laptops. 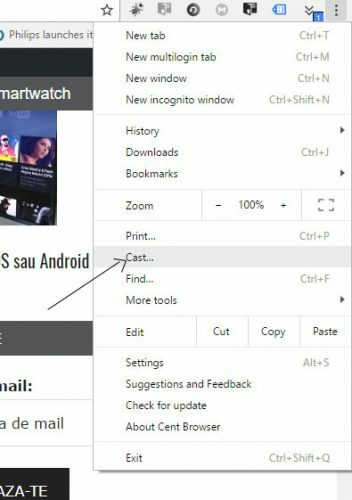 If you want to stream movies or mirror your laptop’s screen on the TV, just activate the “Cast” option from the settings menu of Google Chrome browser. So, what can you actually stream using Chromecast? There are quite a few popular compatible apps. Mostly, you can use Netflix, HBO Go, Facebook Video, Dailymotion through Chromecast, just to name a few. Basically, your smartphone or laptop becomes a smart remote for your TV. All you need to do is to download the intended app on your smartphone and then share it with your TV via Chromecast. Use your smartphone’s volume buttons to adjust the TV volume, and the on-screen controls to rewind or fast forward the videos. Once Chromecast is on and paired with your smartphone, the above apps will gain a “Cast” icon. Just tap the icon and you’ll be able to watch your favorite movies on your TV. 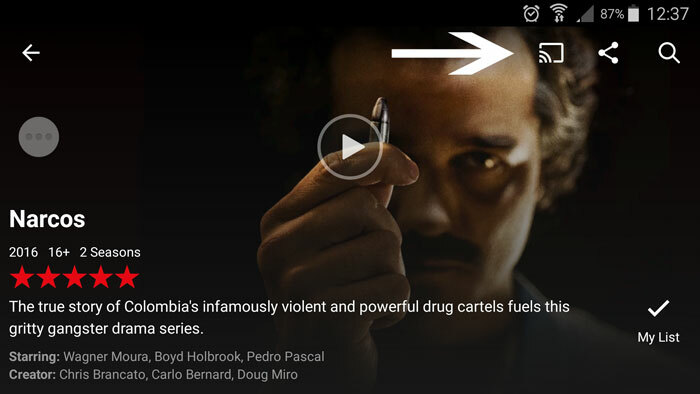 Netflix lets you watch your favorite movies and TV shows on your TV. The same goes for HBO Go. Youtube allows you to watch any video on your TV. Facebook streams all your friend’s videos on your TV using Chromecast. The “Cast” icon will become available also on your laptop, within Chrome web browser. Just open HBO Go or Netflix and log in. Then, choose your movie and press the “Cast” icon. It works the same for watching Youtube videos on your TV. All in all, you now have an affordable and capable Smart TV. How do you watch online TV using Chromecast and your smartphone? Chromecast lets you watch free online movies and shows by mirroring audio and video data from your smartphone to your TV. We’ve chose an online TV app as example. But you can choose any online tv app that works with VLC and Sop to HTTP. We download 3 apps that allow online movie viewing – VLC for Android, Sop to HTTP for Android and Tv Plus. All three apps are available on Google Play. Then, we install these apps on the Android smartphone. 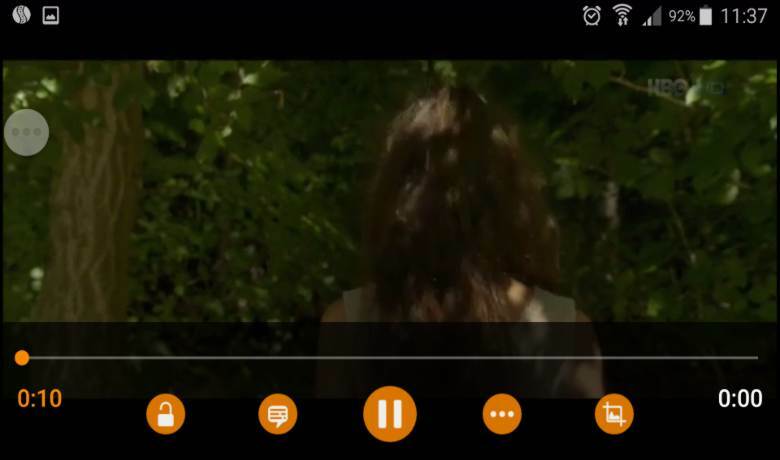 VLC will be set as default player for playing movies on the smartphone. We start the online TV app from the smartphone and at the same moment Sop to HTTP app will start running as well. Choose the online TV channel you want to watch and then choose VLC to start viewing. Once you’re done with these steps, open up Google Home and choose “Stream screen” from the left corner of the screen. Select Chromecast (or whatever name you chose for your gadget) and the TV will start playing the contents of your smartphone. You can use the same process to stream downloaded movies on your smartphone, this time using just VLC. As you can see, Chromecast is a very useful and cheap gadget. You will end up with a Smart TV and more. You can watch online movies, online TV shows, and even play games specifically developed for Chromecast. Your smartphone turns into a decent gaming controller. Overall, Chromecast is a great choice if you don’t own a Smart TV or a phone that supports automatic mirroring to your TV screen. Since the price is low, it’s worth every penny, whether you are using it on a daily basis or once in a while.